Carl Hausman is professor of journalism at Rowan University and has worked in television, radio, and new media. Hausman was one of the team of faculty who developed the university’s New Media minor and has developed the department’s online course presence. He is currently producing and narrating audiobooks from his home in suburban New Jersey. Philip Benoit is retired from a career in higher education, most recently as an adjunct professor of journalism at Millersville University. He, too, is an audiobook narrator, and has developed an extensive array of online video instruction. Fritz Messere is Founding Dean of the School of Communication, Media and the Arts at the State University of New York at Oswego. He is an expert technologist who has also written extensively on the broadcast industry. I've used several broadcast announcing texts, but this one is superior! It's an easy read, provides lots of practical information and exercises, and is one of those books that students could and should keep and use during their careers. I highly recommend this text for any broadcast announcing class. 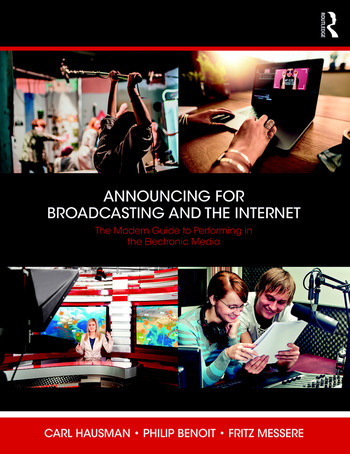 Announcing for Broadcasting and the Internet is a great text for all aspiring broadcast journalists and media performers. It provides students with excellent examples and exercises designed to improve all aspects of on-air and online performance.